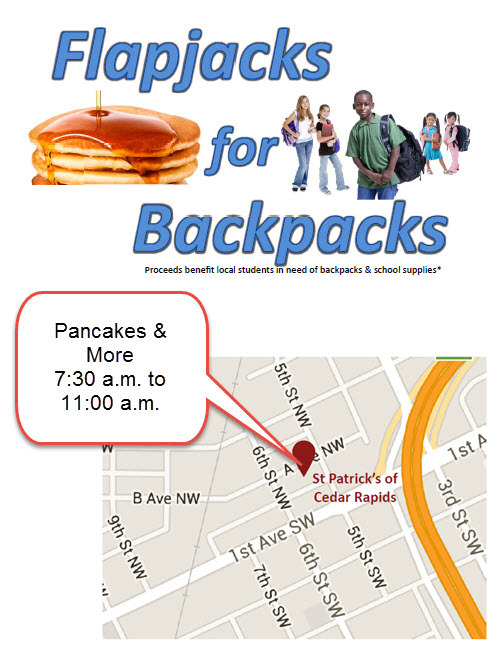 Cedar Rapids West Rotary is excited to be partnering with HD Youth Center and Van Buren Elementary School for the “2017 Back to School Backpacks” program. This year's Rotary West Pancake Breakfast benefit is Saturday, March 25, 2017 at the St. Patrick's Parish Hall, 120 5th St. NW in Cedar Rapids. You can support our project in a variety of ways. We encourage you to attend. Click "Buy Now" to purchase tickets for $7.50 each, children 5 and younger free. Plenty of pancakes, eggs, sausage, orange juice and coffee for all. Additional support can be provided by "Donating Now". Donations accepted through July 2017. Thank you for providing love and encouragement to over 2,000 area children in need. Over the past years, the following nonprofit agencies have received funds raised by the Cedar Rapids West Rotary's Pancake Breakfast. The amount awarded varied by organization Awards ranged from $200 to $600. CR Community Health Free Clinic Camp Hertko Hollow H.D. Your support this year can help us have at least as significant an impact. If you have questions, possible silent auction items, or any other way you'd like to help, please contact KC Flynn.